Car Geekdom, and a little bit of life. Having been produced from 1971 through 1989 in no less than eight engine configurations, Mercedes-Benz R107 roadsters are hardly rare. In fact, for many of us children of the 1960s, 1970s, and even 1980s, when someone references “Mercedes SL” these are the cars that come to mind. 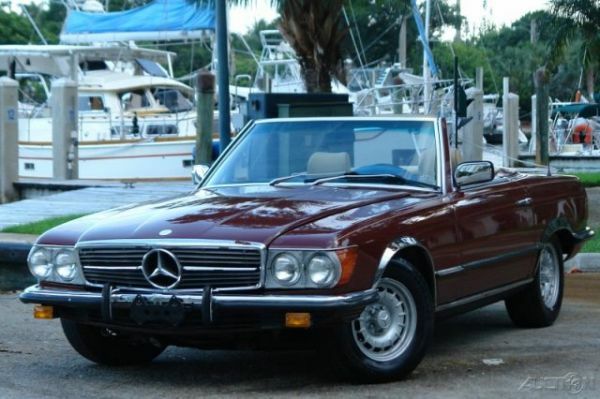 Here in the US, however, we only really got three “official” versions of the R107: the 450SL (and 350SL 4.5 which was the same car) from 1972 through 1980, the 380SL from 1981 through 1985, and the 560SL from 1986 through the end of production. That leaves a lot of SLs that never made it to our shores, including anything across the range that came with a manual transmission. That’s what makes this Euro-spec car on CraigsList in Fort Lauderdale, Florida a rarity. That, and its low $4,400 asking price. Last week’s trip to Europe has me contemplating all sorts of next moves related to the things automotive in my life. Really, there are 2 considerations: upgrade the Accord Hybrid to something modern and fun with all of the bits and baubles that one expects with a new car, or buy something fun as a weekender – ostensibly in place of the recently-acquired Mercedes 300D Turbodiesel – that may even be well-positioned to start appreciating if looked after. Truth be told, as dull as the Honda is, I cannot deny the benefits of using the carpool lanes to commute from Fairfax, VA to Washington, D.C. every day. It easily saves me an hour a day. That leaves me looking at the classics. Enter your email address to follow TotallyThatStupid and receive notifications of new posts by email.